The Center for the Improvement of Early Reading Achievement (CIERA) offers a wealth of research-based information and resources to people who impact children's early reading achievement: teachers, teacher educators, parents, policymakers, and others. Navigation is made simple with the tabbed menu at the top of each page as well as a text navigation bar at the bottom. The site is fully searchable and a site map is also provided. The Center for the Improvement of Early Reading Achievement (CIERA) represents a consortium of educators from five universities and receives support from the Department of Education for research on the learning and teaching of effective reading skills to children at an early age. 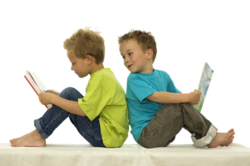 The Center focuses its research on three areas that influence children's early reading acquisition: Characteristics of readers and texts and their relationship to early reading achievement; Home and school effects on early reading achievement; Policy and professional effects on early reading achievement. Teachers will want to browse through the archive of research reports and articles on such topics as differentiating literacy instruction, how television impacts the development of reading comprehension and early literacy for inner-city children among others. Perhaps of more interest to teachers will be the technical reports that are grouped according to the three areas of focus and include such topics as informational text, word learning, effective schools, and more. In addition to the research, CIERA also sponsors a Summer Institute and provides an archive of reading related presentations online.